Our videos can be seen in the education section (the playlist is embedded at the bottom of the first page) and on the specific object “detail” pages. We jumped at this opportunity because the Art Project has such enormous educational potential. It is critical to gather works of art from different institutions to tell the nuanced stories of art history. 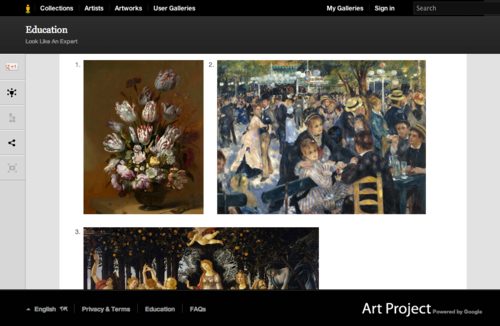 The Art Project brings together works of art from 151 museums in 40 countries within a cohesive visual environment. 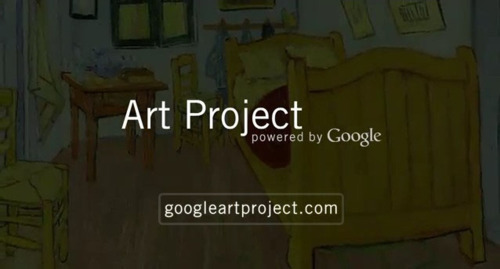 The high resolution images, powerful zoom function, “Museum View” (an interior version of “Street View”) and the ability to collect and annotate images, are all features that are ideal for teaching and learning. For a “Museum Without Walls” is coming into being, and…it will carry infinitely farther that revelation of the world of art…which the “real” museums offer us within their walls. 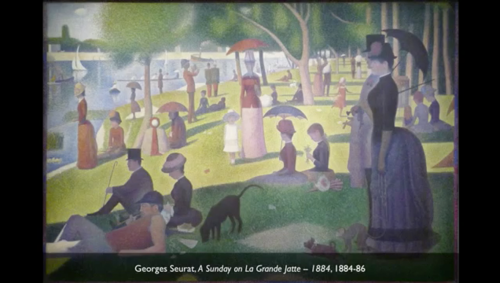 As always, all Smarthistory.khanacademy.org content is free and open. If you’re an art historian, museum educator, or curator, and you’re interested in contributing to the work we’re doing, please contact us. We especially want to thank Colleen Brogan and Rachel Ropeik for coming through in a pinch and for their uncanny ability to make complex ideas clear. Khan Academy is best known for our Math and Science content, but our goal has always been to provide a free world-class education on as many subjects as possible. However, we knew that other subjects, particularly Art and History, require a different take on how to present the topics. We were thrilled to find Dr. Beth Harris and Dr. Steven Zucker, the creators of SmartHistory. Their style of spontaneous conversations, where speakers are not afraid to disagree and challenge each other, really resonated with us. Their videos are short, casual, approachable, interesting, and thought-provoking, and they bring many of the same sensibilities that have really resonated with our audience. We are pleased to announce that we are joining forces. Dr. Beth Harris and Dr. Steven Zucker will join our faculty and lead the creation of Art, History, Architecture, and other content in the humanities. They have already created over 300 videos, and you can see them all at: http://smarthistory.khanacademy.org. Over time, expect to see tighter integration of their content on http://www.khanacademy.org. We think this is the beginning of a tremendous collaboration, and we are incredibly excited to push the frontier on freely available content in the Arts and Humanities.